This versatile condiment is great as a topping or a dip. 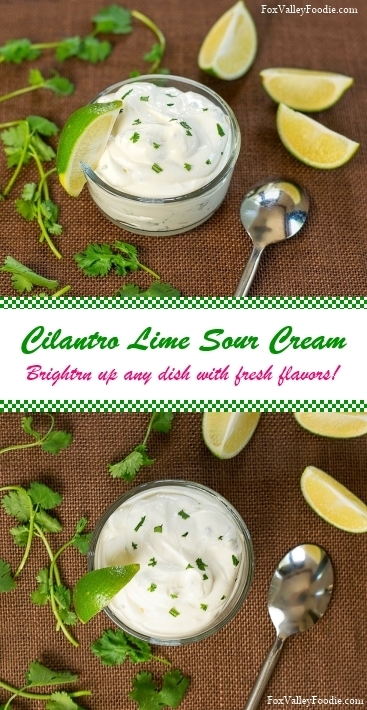 Cilantro Lime Sour Cream Sauce has bright fresh flavors that will liven up any dish! 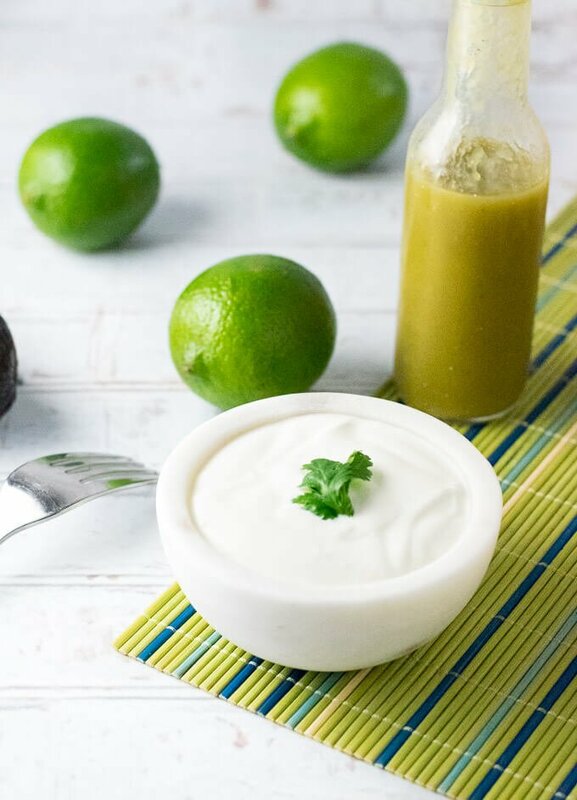 Cilantro Lime Sour Cream Sauce is like that cool friend of yours who makes everything better! Kinda like Joe Camel, smoooooth and refreshing! Oh, but without the whole cancer thing. Paint it’s bright flavor on any of your favorite Mexican food to really liven it up! This cilantro lime sauce is dead simple to make. 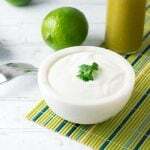 The ingredient list is minimal, using lime juice, sour cream, cilantro, garlic, and salt. The ingredients simply need to be prepared and mixed together. 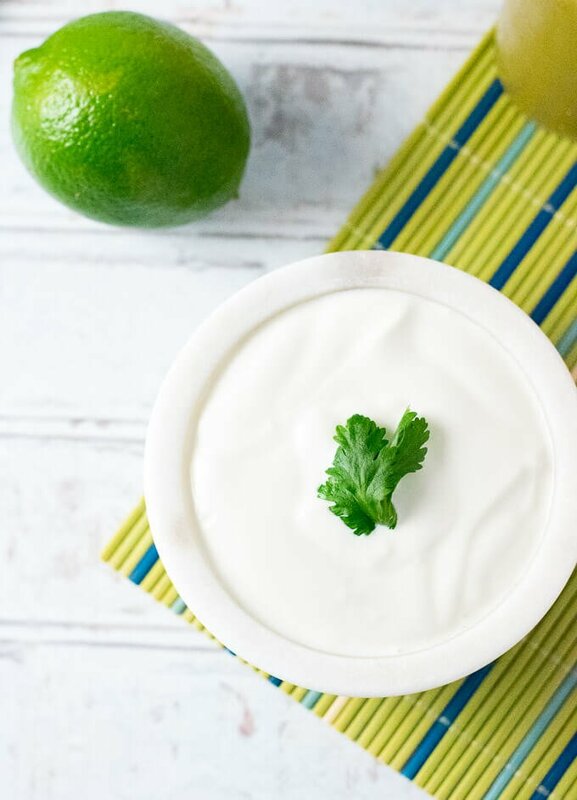 Salt and lime juice are both natural preservatives, so you can expect your cilantro lime sauce to last as long as your sour cream. This is a perfect condiment to make in advance and use it for multiple meals. I simply save the empty sour cream container and store the Cilantro Lime Sour Cream Sauce in there. This is the perfect condiment to dress up any Mexican or Carribean meal. Some of my favorite applications include using Cilantro Lime Sour Cream Sauce on fish tacos, chicken tacos, dressing up a chicken wrap, topping my Jamaican Black Bean Soup, or even a tangy twist to roasted sweet potatoes. Really, the possibilities are only limited by your imagination! Serve immediately or store in the refrigerator for up to as long as the sour cream expiration date. IF YOU LIKED THIS RECIPE you will love my Taco Salad with Doritos recipe too! This recipe was originally published on FoxValleyFoodie.com June 1, 2015. If you enjoyed reading my cilantro lime sour cream sauce recipe then you should probably like me on Facebook and follow me on Pinterest too. That’s what I would do at least, because if you don’t get to know me but you still use my recipe it is kind of like taking candy from a stranger, and your mom taught you not to do that. Don’t disobey your mom, subscribe to Fox Valley Foodie today. Made is and loved it. Do you know for how long it keeps n the fridge? I’m glad you love it! It will keep as long as sour cream does. Great recipe! I made it to dollop on enchiladas but my husband used it as tortilla chip dip too.